Go to the official [http://folding.stanford.edu/download.html Folding@Home download page] and download the Windows NT/2000/XP/Vista "No nonsense" text-only console. Save the file to an empty folder on your computer (I like to create a folder in "C:\Program Files\Folding@Home\console1\" - I use "console1" because it is possible to run 2 different instances of the text-only console if you run them in different folder - useful for HyperThreading CPUs). Go to the official [http://folding.stanford.edu/download.html Folding@Home download page] and download the Windows NT/2000/XP/Vista "No nonsense" text-only console. Save the file to an empty folder on your computer (I like to create a folder in "C:\Program Files\Folding@Home\console1\" - I use "console1" because it is possible to run 2 different instances of the text-only console if you run them in different folder - useful for HyperThreading CPUs, although you might be better off running the [Folding@Home SMP Console Install|SMP version of Folding@Home] instead). '''Machine ID''': You can set up to 8 different machine IDs, allowing you to run multiple instances of Folding@Home on your computer (one instance for each CPU/core/HyperThread). As mentioned before, if you do run multiple instances, the executables must be in different folders. '''Machine ID''': You can set up to 8 different machine IDs, allowing you to run multiple instances of Folding@Home on your computer (one instance for each CPU/core/HyperThread). As mentioned before, if you do run multiple instances, the executables must be in different folders (although you may be better off running the [Folding@Home SMP Console Install|SMP version of Folding@Home] instead). This short guide shows you how to install the text-only console version of Folding@Home, and to set it up so you can join the Grim Rippers folding team. Go to the official Folding@Home download page and download the Windows NT/2000/XP/Vista "No nonsense" text-only console. Save the file to an empty folder on your computer (I like to create a folder in "C:\Program Files\Folding@Home\console1\" - I use "console1" because it is possible to run 2 different instances of the text-only console if you run them in different folder - useful for HyperThreading CPUs, although you might be better off running the [Folding@Home SMP Console Install|SMP version of Folding@Home] instead). Go to where ever you saved the text-only console executable and run it. If this is the first time you've run Folding@Home, you will be presented with a series of questions - answering them will set up the Folding@Home application. Machine ID: You can set up to 8 different machine IDs, allowing you to run multiple instances of Folding@Home on your computer (one instance for each CPU/core/HyperThread). As mentioned before, if you do run multiple instances, the executables must be in different folders (although you may be better off running the [Folding@Home SMP Console Install|SMP version of Folding@Home] instead). 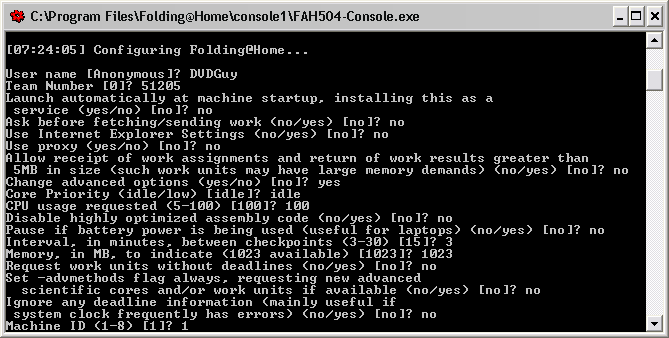 Folding@Home will start processing after you have finished the configuration, or if this was not the first time you have run Folding@Home. You can quit Folding@Home by pressing "CTRL-C" to close the Folding@Home command line window. You can create a shortcut to the Folding@Home executable, and place it in your Start Menu's "Startup" folder to make Folding@Home launch automatically on start up, if you wish. And if you need to access the configuration again, click on the "Start" button, select "Run" and type in "C:\Program Files\Folding@Home\console1\FAH504-Console.exe" - config (change the path/filename to where you saved the text-only console executable, and don't forget the quotes around the path). There are some other text-console commands that can be used in this way too. This page was last modified on 21 August 2007, at 08:56.